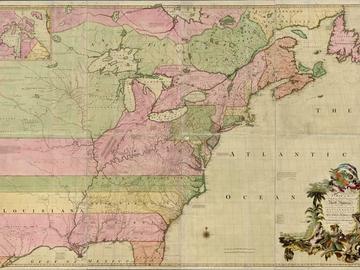 "The Mitchell Map of 1755"
In 1755 Lancaster County, Virginia native John Mitchell created perhaps the most important map of eastern North America made in the colonial period. Used during negotiations at the Treaty of Paris that ended the Revolutionary War, the map measured over 6 ½ feet wide by 4 ½ feet high. Historian Paul Malone presents the remarkable story of the map and its creator, an accomplished man who practiced medicine in Urbanna, studied botany and spent his final years living in London.